As the encircling lights dimmed and the garish pink Idles backdrop cloth was drenched in an eerie wash of light, Bobo, Lee, Jon, and Dev strode onto their raised platform eager to greet their hungry fans. Erratic frontman Joe Talbot followed very shortly after raising his knees in a fast-paced, dramatized march gleaming a bold smirk. The ominous repetitive strumming of ‘Colossus’ charged a sharp bolt of electricity into the sea of fans that had already lurched forward in the hopes to grasp at Talbot’s caricature-like physique. ‘Colossus’, Idles’ pounding opener for their monumental sophomore album Joy proved to be the perfect warm-up for the rest of the evening’s frenzied antics. Manchester’s Albert Hall heaved and pulsated in waves with the quintet’s every motion. The hall’s stained-glass windows, amphitheatre structure, and wooden trims were particularly fitting as Talbot stretched his left arm out to deliver his sermon, “Forgive me, Father, I have sinned”. By this point, sweat had already begun to trickle down the backs of adoring fans as they swayed in unison from right to left. The view from the limited seats looking down on the crowd below must have been biblical. Almost as if Talbot himself was parting the red sea. I turned to my friend as the song reached its unsettling brief mid-silence and whispered “I’m scared” with excited and nervous energy. Moments later half of the floor were flung from the back as if they were trapped in a pinball machine to the sound of Talbot’s scratchy “Aaaaaah”. This relentless and undivided vitality rebounded off every sweaty body into every crevasse of the Albert Hall. Idles possess a presence that singles out every individual in their grasp, making them feel and believe that they are important. That they are seen and that they are loved. Although guiding their followers with a stirring and hypnotic anger, there is absolutely nothing aggressive or hateful in their preaching. Bobo incessantly fluttered from one side of the stage to the other as he greeted fellow guitarist Lee who dizzily hurled his body back and forth making a duck walk movement, with his footing offering a consistently entertaining spectacle. The two spread their warmth to either side of the venue ensuring that the fans on the periphery were never left dissatisfied. In fact, both joined their onlookers either by diving headfirst into their crowd or joining them on the balcony. Talbot introduced each song from the band’s setlist with a short yet bold and revealing christening. Tracks off the band’s poignant debut Brutalism such as ‘Divide & Conquer’, ‘Heel/Heal’, ‘1049 Gotho’ and of course, fan favourites ‘Well Done’ and ‘Mother’ were all welcomed with outstretched limbs and flying shoes. It wasn’t long before a fan passed by with blood dripping out of one nostril, still with a crazed expression on his face. It is entirely fair to say that Idles are causing a mammoth-sized stir in the live music scene, one that, since seeing them for the first time back in October 2017, has still remained unmatched. If anything, the fan base has since expanded and with that has come an overwhelming sense of community. Throughout their entire set, there were moments when you couldn’t even hear Joe’s brash lyricism. Fans knew every lyric, every backing dialogue, and studio exclusive additions. 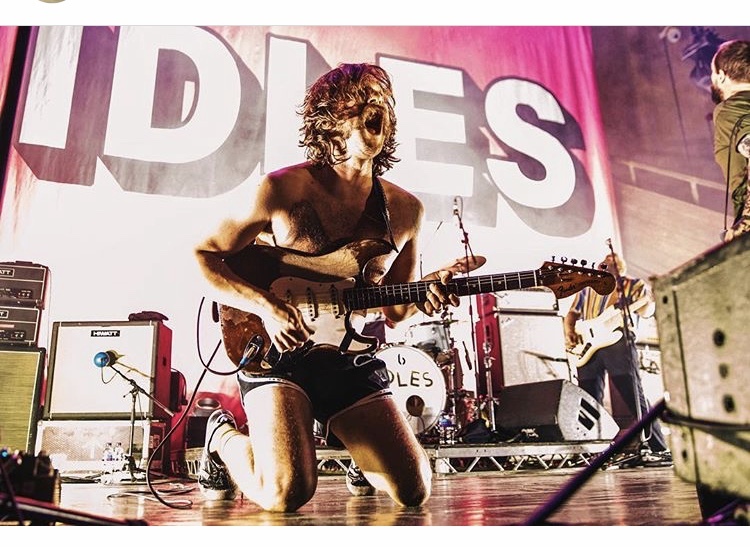 Idles continue their sold-out tour dates until May when they join a plethora of festival line-ups including this year’s reigning line-up of Greenman Festival 15th-18thAugust 2019.